Wash all of your strawberries and make sure to dry them well. In a double boiler melt the chocolate, mixing continuously until completely melted. 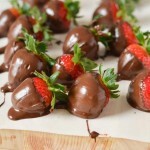 Dip the strawberries into the melted chocolate and place onto a cookie sheet lined with parchment. Refrigerate to harden and serve as desired. Keep in refrigerator for 2-3 days and only out of refrigeration for about 3-4 hours.